aptain America is back again, fighting against the notorious Red Skull and the nefarious evil scientist Baron Zemo — but this time in pinball format. 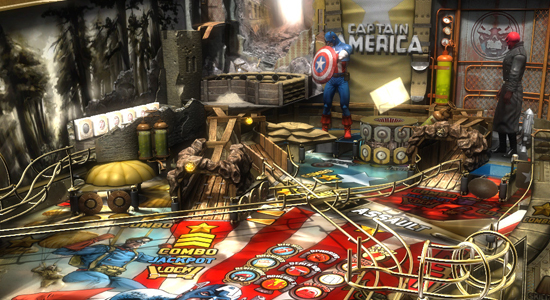 The Captain America table is the newest addition to Marvel Pinball for PS3 and Pinball FX2 for the Xbox 360. If you are familiar with the comic books you will notice a lot of familiar plot devices around the table and through mini-games. Captain America is standing next to a pillar, which can be lowered by hitting the triggers at the base, providing access to the Cosmic Cube — which can be snagged for a lot of points. If you make it into the enemy castle, you can choose to fight Red Skull in hand-to-hand combat, defend against Zemo's Death Ray, or destroy Zemo's Adhesive-X canisters that will slow your ball down greatly if it hits the puddles. You may also notice the lanes to the sides of the flippers spell out "BUCKY," an allusion to Captain America's long-time sidekick Bucky Barnes. If you're willing to drop a few bucks, this is a very high-quality table and a great expansion to your collection. There's a lot to do that will keep you playing for a good while. I'm discovering new things each time I play it. There are also new trophies/achievements for the collectors out there.